What did the five fingers say to the face? SLAP! 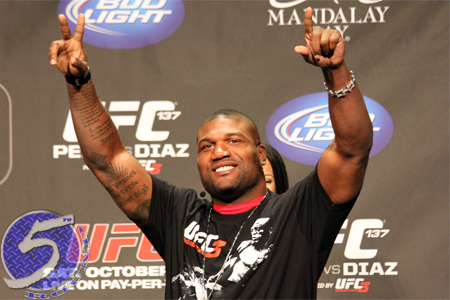 Quinton “Rampage” Jackson (Pictured) may need both of his knees surgically repaired, but his injured legs clearly don’t affect his pimp hand. After leaving Greystone Manor nightclub in Los Angeles, California Thursday night, the former UFC light heavyweight champion was approached with an unusual request. A drunken fan asked Rampage to slap him across his grill. Contrary to the video evidence, as an Asian-American I would like to let the world know that we’re not all this dumb. Then again, liquid courage does curious things to a person.